French and style. The two words are synonymous. They blend together seamlessly like the interplay between a well-positioned lamp and the perfect choice of carpet. Classic French interior design is minimalistic. The sparse placement of furniture and accessories means that each piece truly stands out and occupies its position fully and completely. Backdrops are traditionally neutral to help enhance the details of the room. Having neutral coloured ceilings and walls and a deep, walnut stained oak floor can be one way to achieve this, Another option, while slightly bending this convention, is to have a neutral ceiling, floor and a wooden feature wall. Allow this wall to provide the dynamism of the room and keep furniture, accessories and décor sparse to bring attention to it. However ensure that the room is appropriately lit as wood can “absorb” light and make a room seem darker than it should be. Your colour palette is also important. Classic Parisian design either operates with a pale or bold palette. For a pale palette, think neutral off whites, whites, taupe, mushroom, and soft greens and greys. Touches of gold and silver would add a touch of luxury and a vast wooden floor would provide a gorgeous, deep foundation for everything else. For a bold palette, use richer colours to bring some vibrancy into your living room design ideas. Peacock blue, teal and emerald greens and reds when placed appropriately look amazing. These colours also really demand attention when a wooden ceiling is installed. Complement these above palettes with houseplants, bookshelves and other accessories. Chandeliers are also often included in classic French design themes. Should You Mix the Old with the New? The French have always known just when to mix the contemporary and the classic. 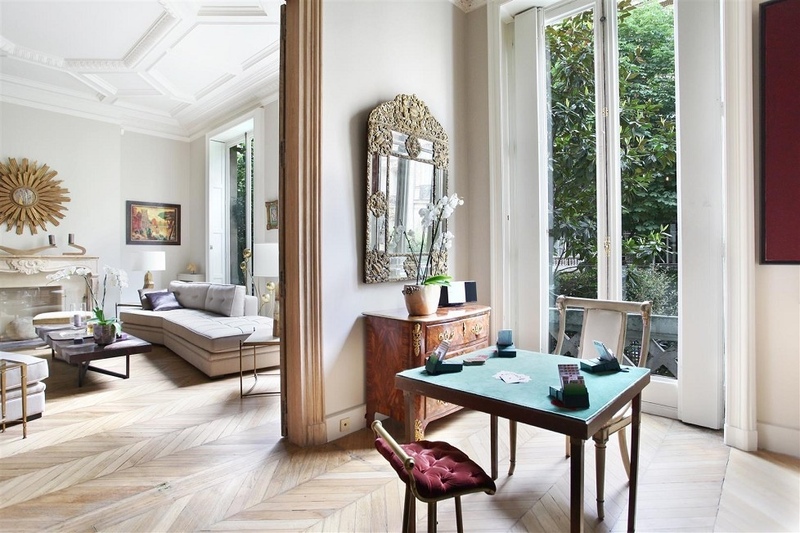 Modern, open-plan rooms with minor nods to other design aesthetics are permissible as long as the Parisian feel is adhered to in palette choice. A large attic converted into a living space with spacious wooden floors and high wooden ceilings is an option for those seeking to blend the modern and the classic. This also applies to décor selections too. Well placed vintage items next to modern appliances is one way to achieve this look. Try: Perugia, Marseille or Nice for a similar effect.